10 Things I Love About Zombies, Run! 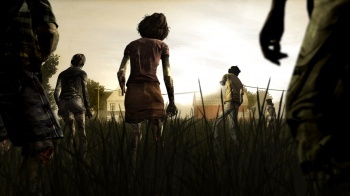 6) It's Practical: The developers are adamant about safety, and you have the option to turn zombie chases on or off if suddenly picking up the pace would be dangerous. Although the storyline encourages you to "head for those trees!" or "get inside the hospital!" the only thing you really have to do is run your normal course. I did see someone on Twitter ask for more "realistic" zombie chases, ie, the runner would have to switch directions to confuse the zombies, but the developer reminded them that that would be pretty dangerous in a world where no one else knows that you're being chased by zombies. Or that you're on a treadmill. Also, instead of eating your brains, the zombies take your stuff when you get "caught." I really hate it when zombies take my axe. While kleptozoms are not typical of our usual zombie myth, it keeps in mind the fact that you're going to want to finish your run, and run tomorrow, and being dead (or undead) won't give incentive for those things to happen. 7) Immersion: I was running to avoid a zombie chase (they last for about a minute, and you'll get 0-3 during a 30 min run. I've never had more than 3.) and I passed another runner going the opposite way. I nearly yelled that she was running right toward the zombies and she should turn and race away like me. But since I don't want to be labeled the neighborhood crazy lady, I didn't do this. I also feel a need, when I pass someone walking, to tell them that they should pick up the pace because of what is behind me, but I don't. I'm not old enough to shout warnings at strangers for no reason. Maybe next year. 8) Music and Audiobooks! You don't listen to the Abel Township story the whole time. You get a snippet of storyline and then you get a song from a previously chosen playlist. If you are listening to a big file, like an audiobook, the app will fade the story out every once in a while to remind you what is REALLY important in life: running from zombies. The downside to this is when zombies are detected, they chase you during the songs (or audiobook.) I was trying to listen to the novel Mrs. Dalloway while running. I ended up trying to both listen to the description of a fancy garden party and run away from zombies. So I do recommend music over audiobooks while using this app. 9) Affordable: Yes, I said affordable. It's more expensive than most other apps, at $7 in the iTunes store, but it's the only app that's gotten me looking forward to running. I've tried Couch to 5K and Runkeeper and Fitbit, and nothing gives me incentive to run, they merely help with intervals or track it when I do run. Now, Runkeeper keeps telling me how I'm hitting new personal records for mileage in runs and mileage in weeks, and I'm losing weight, and my endurance is going up. Yeah, that's worth seven bucks to me. And I'll happily pay for the next season's plotline too. 10) Keeps All Fitness Levels in Mind: You can walk and play since zombie chases require you only to pick up the pace around 10% for a minute. You can run nearly any length of time; once the day's mission is done, Radio Mode begins and gives you two DJs playing your tunes in a more relaxed, banter-filled style more akin to, well, a radio. You can also run supply missions. Right now I'm done with season one, and I felt a pang of regret that was pretty huge; almost the same pang I get at the end of a console game. What now? What happens to the characters who I think of as friends? When will I get new content? The team that made Zombies, Run! is apparently at work making season two, and I am waiting eagerly. I certainly hope it is soon, since the first season is at a bit of a cliffhanger. I think the Zombies, Run! team has succeeded in something no one has before, not even Nintendo; it honestly makes geeks get off the couch. Congrats, team. You deserve a cookie. * I do not advocate running with a shotgun.